Colpermin Capsules are and IBS treatment which helps to ease painful stomach cramps and bloating. Ideal for those aged 15 and over who suffer with IBS and are looking for a reliable way to keep their symptoms under control. Irritable Bowel Syndrome, also known as IBS, is a common condition which causes stomach cramps, bloating, diarrhoea, constipation, and other unpleasant symptoms around your digestive symptom. These is no cure for IBS, but you can help to ease your symptoms using medication. You can also help to relieve your symptoms by monitoring your diet, which will help you identify whether certain foods trigger your symptoms so you can try to avoid them. How will Colpermin help to ease my IBS symptoms? 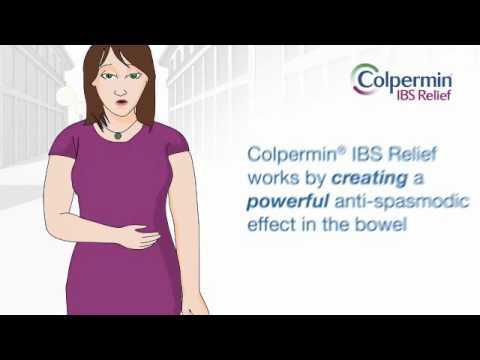 Colpermin IBS Relief capsules contain peppermint oil, which works as an antispasmodic. This means that it eases symptoms of IBS by relaxing the spasm of the bowel wall, easing pain caused by cramps and spasms. It also lets pockets of gas, which can cause the bloating, move through the bowel more freely and leave the body easily. Can I use this medication if I’m pregnant? Speak to your doctor or Chemist 4 U pharmacist before using this product if you are pregnant or breastfeeding. Some medications may not be suitable for you or your baby at this time and a medical professional may need to recommend a different product. Speak to your doctor or Chemist 4 U pharmacist before using this product if you are taking any other medication, including those obtained without prescription. This will help you to be sure that your medications are safe to take together. Swallow 1 Colpermin capsule three times a day. If your symptoms are particularly severe, you can increase your dose to 2 capsules three times a day. Do not take more than the recommended daily dose. Do not take these capsules immediately after food or at the same time as indigestion remedies. When should Colpermin not be used? If you experience these or any other side effects while using this product, stop use and speak to your doctor or Chemist 4 U pharmacist right away. For more information about reporting the side effects of medication, please see the MHRA’s Yellow Card Website. Store in a cool, dry place which is below 25 degrees C. Avoid direct sunlight. Store in original packaging and do not use once expiry date printed on packaging has passed. Keep out of sight and reach of children. Adults and elderly: One capsule three times a day; the dose may be increased to two capsules three times a day if necessary. Do not take immediately after food. Do not chew or break the capsules. Do not take indigestion remedies at the same time of day as this medicine. If your condition does not improve after two weeks of treatment, consult your doctor. Other ingredients are: Gelatin, colloidal silica, titanium dioxide (E171), indigotine (E132), Eudragit L, Eudragit S, triethyl citrate, ammonia, monostearin, polyethyleneglycol 4000, talc, purified water, beeswax, refined arachis (peanut) oil. Not recommended for children under 15 years. Swallow whole to prevent local irritation of the mouth or oesophagus. The diagnosis of IBS should be confirmed by a doctor before taking an IBS treatment.